I read and enjoyed both of Ali McNamara’s previous novels ‘From Notting Hill With Love … Actually’ and ‘Breakfast at Darcy’s’ and so when I found out that she had a new romatic tale coming out, I looked forward to delving into it and catching up with the herioine from her first novel Scarlett O’Brian. Ali’s style of novel is very much the same as that found in a chick-lit movie. Sometimes things happen that seem entirely implausible in real life, and some readers might not find that to be their cup of tea, but in these novels and indeed in the movies from which they seem to be inspired, these things are just parr for the course. Some readers may find a romantic trwasure hunt round manhattan to be unrealistic and completely fanciful, but let me tell you, my friend did the equivalent in London when he propsed to his fiancé and so that part of the novel was totally relatable to me! The main character Scarlett, her boyfriend Sean, her family and friends all return from Ali’s first novel, and being a fan of returning characters, not necessarily as a series but just meeting familiar friends once again, I really enjoyed this aspect of the book. Scarlett used to be a bit of a rom com addict and so a lot of the storyline of the first novel revolved around her finding movie meanings in everything going on in her real life. Whilst she is not as hooked on movies as she was in the previous novel, a lot of the things that happen to Scarlett in this new novel are found in some of the movies set in New York, and her reactions to these things I found just as endearing as in the first novel. Just like her namesake, Scarlett O’Hara, the heroine of these novels in headstrong and when she sets her mind to something, nothing will stand in her way, a really good example of a strong female character in fiction today. The setting of the novel is something else I really enjoyed about this book. I am a bit of a lazy reader when it comes to settings. I much prefer a book to be set somewhere I am familiar with, or at the very least, somewhere which actually exists as opposed to a fantasy setting, and New York is just about the perfect setting for me. All of the places that Scarlett went to, I have visited myself. Ali said that she really enjoyed going to New York to research the setting, and I completely jealous of her getting to do that. I would love to go back, but for now I shall settle for reading about it, especially when it is described in such a vibrant and exciting way as it is here. As I mentioned, some of the slightly more implausible events that befall our heroine in this novel might not be quite to everyone’s taste, but I think that the storyline is great fun, and a wonderful form of escapism. It could also be argued that the storyline is somewhat predictable, but I think that whilst the ending is something that the reader might expect from the word go, there are enough twists and turns throughout the book to keep you on your toes, and keep turning those pages. Even if you haven’t read Ali McNamara’s previous novels, this works really well as a stand-alone story even though it bring back characters from her first novel, and it a really quick read with something for every fan of chick-lit. 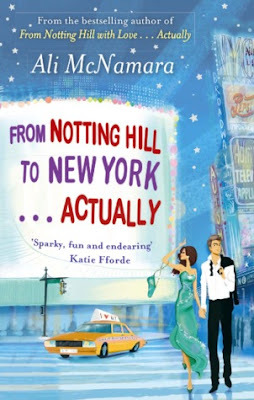 I recommend that you travel with Scarlett across the pond and dive into an adventure in New York! This sounds like a lighthearted, whimsical romance and sometimes that is perfect! I think this certainly sounds like a fun read! I'd definitely enjoy this if I read it, and it's a MAJOR bonus that it's set in NYC! It's a fabulously light and funny read, and quick too!